FREMONT, Calif., (GLOBE NEWSWIRE) — Aehr Test Systems (NASDAQ:AEHR), a worldwide supplier of semiconductor test and burn-in equipment, today announced financial results for its 2018 fourth quarter and fiscal year ended May 31, 2018. Net sales were $7.3 million, up 9% from $6.7 million in the fourth quarter of fiscal 2017. GAAP net income was $191,000, or $0.01 per diluted share, compared to a GAAP net loss of $795,000, or $0.04 per diluted share, in the fourth quarter of fiscal 2017. Non-GAAP net income, which excludes the impact of stock-based compensation expense, was $365,000, or $0.02 per diluted share, compared to a non-GAAP net loss of $587,000, or $0.03 per diluted share, in the fourth quarter of fiscal 2017. Net sales were $29.6 million, up 56% from $18.9 million in fiscal 2017. GAAP net income was $528,000, or $0.02 per diluted share, compared to a GAAP net loss of $5.7 million, or $0.35 per diluted share, in fiscal 2017. Non-GAAP net income was $1.5 million, or $0.07 per diluted share, compared to a non-GAAP net loss of $4.7 million, or $0.29 per diluted share, in fiscal 2017. Backlog as of May 31, 2018 was $8.4 million, compared to $12.7 million as of May 31, 2017. Total cash and cash equivalents at fiscal year-end was $16.8 million. Completed customer acceptance, manufacturing release and first production shipment to lead customer of new high-voltage channel module-based FOX-XP™ test and burn-in system for wafer-level burn-in of silicon photonics wafers in a single touchdown. Shipped initial production FOX-XP system to new customer for test and burn-in of integrated silicon photonics devices for data communications applications using Aehr’s proprietary DiePak® carriers, which allow single socketing for both functional test and burn-in of their singulated bare die. Received initial order for new DiePak carrier design from Aehr’s FOX-XP lead customer for a next-generation device to be used on their installed base of FOX-XP test and burn-in systems. Received follow-on orders of $2.5 million for WaferPakTM full-wafer contactors and services for Aehr’s installed base of FOX wafer-level test and burn-in systems. Successfully completed shipments of the initial production order for ABTS™ thermal chambers to Aehr’s OEM customer for a very high-volume test and burn-in application. “Fiscal 2018 was a key year for Aehr Test, as we continued shipments and installations of our new FOX-XP multi-wafer and singulated die production test and burn-in system to our three lead customers. These systems are for production test applications that include 2D and 3D mobile sensors as well as silicon photonics wafer level and singulated die devices. We continue to have a very good business relationship with these lead customers, and are encouraged that each of them has communicated their commitment to use our products in production of their initial devices as well as follow-on devices on their roadmaps including this year. We are engaged not only in new device test opportunities with these lead customers, but also with several new potential customers for similar applications, as well as several new devices in the mobile and automotive space where safety, security and 100% certainty of reliability testing are critical. “During this fiscal year, we will be making significant investments in our sales and marketing as well as improvements in our manufacturing infrastructure to meet the anticipated growth in our target markets and to be able to provide the increased capacity for our FOX wafer and singulated die level test and burn-in products. For the fiscal year ending May 31, 2019, the company expects full year total revenue of at least $35 million and significant growth in profit for the year. 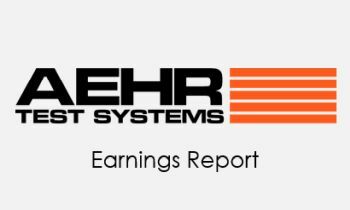 Aehr Test Systems will host a conference call and webcast today at 5:00 p.m. Eastern (2:00 p.m. PT) to discuss its fiscal 2018 fourth quarter and full year operating results. To access the call dial 877-260-1479 (+1 334-323-0522 outside the United States) and give the participant pass code 6422870. In addition, a live and archived webcast of the conference call will be available over the Internet at www.aehr.com in the Investor Relations section. A replay of the conference call will also be available via telephone beginning approximately two hours after conclusion of the call through 8:00 p.m. ET on July 26, 2018. To access the replay dial-in information, please click here. Headquartered in Fremont, California, Aehr Test Systems is a worldwide provider of test systems for burning-in and testing logic, optical and memory integrated circuits and has an installed base of more than 2,500 systems worldwide. Increased quality and reliability needs of the Automotive and Mobility integrated circuit markets are driving additional test requirements, incremental capacity needs, and new opportunities for Aehr Test products in package, wafer level, and singulated die/module level test. Aehr Test has developed and introduced several innovative products, including the ABTS™ and FOX-P™ families of test and burn-in systems and FOX WaferPak™ Aligner, FOX-XP WaferPak Contactor, FOX DiePak® Carrier and FOX DiePak Loader. The ABTS system is used in production and qualification testing of packaged parts for both lower power and higher power logic devices as well as all common types of memory devices. The FOX-XP system is a full wafer contact and singulated die/module test and burn-in system used for burn-in and functional test of complex devices, such as leading-edge memories, digital signal processors, microprocessors, microcontrollers, systems-on-a-chip, and integrated optical devices. The WaferPak contactor contains a unique full wafer probe card capable of testing wafers up to 300mm that enables IC manufacturers to perform test and burn-in of full wafers on Aehr Test FOX systems. The DiePak Carrier is a reusable, temporary package that enables IC manufacturers to perform cost-effective final test and burn-in of both bare die and modules. For more information, please visit Aehr Test Systems’ website at www.aehr.com. Non-GAAP net income (loss) is a non-GAAP measure and should not be considered a replacement for GAAP results. Non-GAAP net income (loss) is a financial measure the Company uses to evaluate the underlying results and operating performance of the business. The limitation of this measure is that it excludes items that impact the Company’s current period net income (loss). This limitation is best addressed by using this measure in combination with net income (loss) (the most directly comparable GAAP financial measure). These measures are not in accordance with GAAP and may differ from non-GAAP methods of accounting and reporting used by other companies.